Hello visitors. 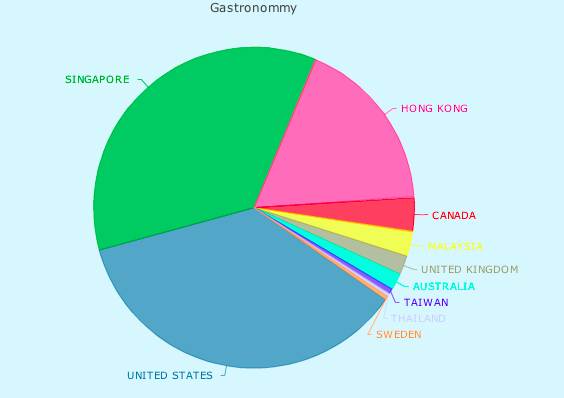 I was taking a look at Nuffnang's analytics of Gastronommy from the past 2 weeks. It seems most of you are from Singapore, USA and Hong Kong (unsurprisingly)! But I'd like to know more! On the right side bar there's a poll option asking if you're a dude or girl. Click away! hola mamma cita. thats quite an interesting banner you have going on there! whoever made that must be talented, but could use with some more time to refine whatever he's trying to do. haha. i've been lurking long enough and its time to come out of the woodwork, whatever the hell that saying means. actually, do you even count as a lurker when you know the blog writer in meatspace? bee tee double you, gonna book my flight to SG soon, will hit you up with deets over email! also, your poll is flawed, cause being a dude or babe isn't mutually exclusive. i'm a dude's dude but sometimes i feel like a babe, and want to be treated like one! nobody puts baby in a corner! Comment! Hi, love the new-look website, even told friends about it.